2007 Price 150 DOLLARS !! 150 DOLLARS SHIPPED PRIORITY !!! ONLY 30 PHONES LEFT !!!! Price going up Jan 1st, buy now ! 2007 price now 150 DOLLARS !!! CLICK LINKS ON LEFT FOR MORE ITEMS !!! This is a corded phone that plugs into any phone outlet, not a wireless cellphone. 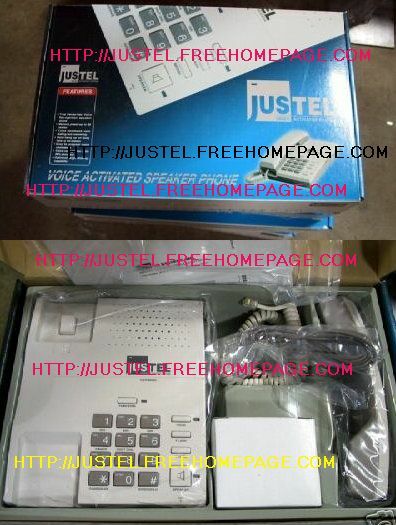 JUSTEL VA2000 VOICE ACTIVATED HANDS-FREE PHONE with dialtone only hang-up. Perfect for the wheelchair handicap people with a disability. HANDS-FREE VOICE CALLING, ANSWERING AND HANG-UP ON DIALTONE. ONLY. ** If you don't get a dialtone after hang-up, thats a phone company issue, not a phone problem, and i am not responsible for that. JUST PROGRAM YOUR PHONE NUMBERS, TRAIN WITH VOICE COMMANDS, AND YOU NEVER HAVE TO PICK UP A PHONE AGAIN. * Only button to push is to change the number directory. 3 directories of up to 20 numbers. BRAND NEW IN BOX, With handset, power supply, cords and manual. Plug in and program, simple. This is a corded telephone and speakerphone, just plug into phone outlet, program and use. not a wireless cellphone. As with any voice activated system, background noise can affect phone. For best results, mount telephone in a quieter environment. JUSTEL VA2000 100% VOICE ACTIVATED SPEAKERPHONE - no need to touch phone to dial or hang up. Changing directories does require pushing one button. This is a corded telephone speakerphone that plugs into any standard phone jack, its not a wireless cellphone. Automatic hangup (on dialtone) ** If you don't et a dialtone, thats a phone company issue, not a product issue, and i'm not responsible for that. * Background noise may affect phone, just like any other voice activated system. For best results, mount phone in a quieter room. Works as voice activated speakerphone, regular Speakerphone, or handset alone. Automatic hang-up on dialtone. ** It must recognize dialtone. If it doesn't, it's a phone company issue, not a phone issue. * 3 directories of 20 numbers, you must push a button to change the directories. * Background noise may affect phone, no voice activated system is perfect. VOICE ACTIVATED PHONE SYSTEM: True Hands free voice recognition speaker phone. Memory preset up to 60 names. Voice Command auto dialing & answering. Auto hang up on busy tone or no answer. Optional digit dialing capability. As with anything voice activated, background noise may affect phone. This is a corded telephone that plugs into and standard phone jack. It is not a wireless cellphone. * Background noise may affect phone capabilities. * You must push a button to change directories of numbers. Exchanges Only, No Refunds given because i'm not a store for people to try. If for some reason you need a exchange, Everything must be included, and serial #'s must match. I UV coat each phone to prevent tampering, which will void warranty. Any damage or deviation from this voids a refund. On the rare chance i might refund, Refunds will only be $50 because i can't sell as new. PLEASE ASK QUESTIONS BEFORE PURCHASING !!! I take no blame because someone can't read all my information and ask questions before buying. The information provided is very detailed, but if it's something i missed, its your responsibility to ask. I will not be held responsible for buyers errors. I post this because I have had 2 dishonest people buying my phones and sending me back their old broken phones. MANUAL & INSTRUCTIONS ON ABOUT PAGE ON TOP LEFT !!! I will ship to canada for $150 under certain conditions. Please supply your name and USA shipping address so i can confirm before i ship. ** IMPORTANT = If you do not get a dialtone after person hangs up, thats a phone company service issue, not a phone product issue, and I take no responsibility with that. Also, if you want to change the directories, you must push a button. These are great phones for the handicapped, and as with any voice activated system, it is not perfect 100% of the time. If it was perfect 100% of the time, id charge $500. Thankyou. 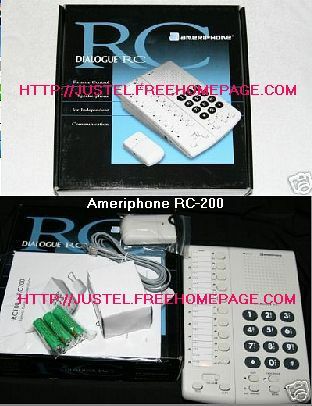 AMERIPHONE RC200 For !!! Voice activated answering only, NOT a totally voice activated dialer like the Justel. You control with a WIRELESS MOUSE by tapping buttons or with optional accessories below. Box, instructions included. No batteries included.